We recently exhibited at the ASLA Expo in Los Angeles where we showcased our latest innovations to the Landscape Architecture community. If you did not make it to the show, we’ll tell you what you missed. Launched earlier this year, the Carson Series coordinates benches, a leaning rail, and a bike rack. It is quickly gaining attention for its smooth lines and simple comfort curves. 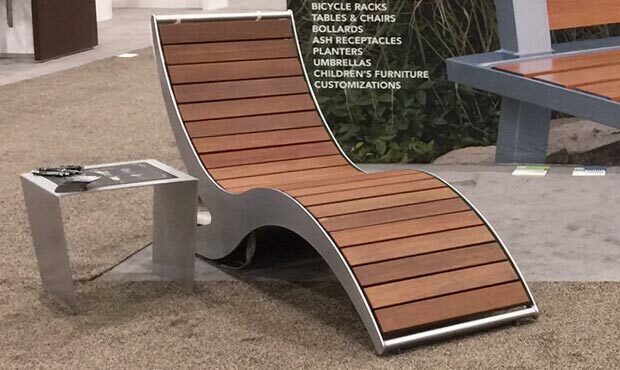 The bench with back evokes the style of a classic park bench with an updated feel, while the leaning rail and bicycle rack mimic the clean construction of the bench in eye-catching yet functional shapes. 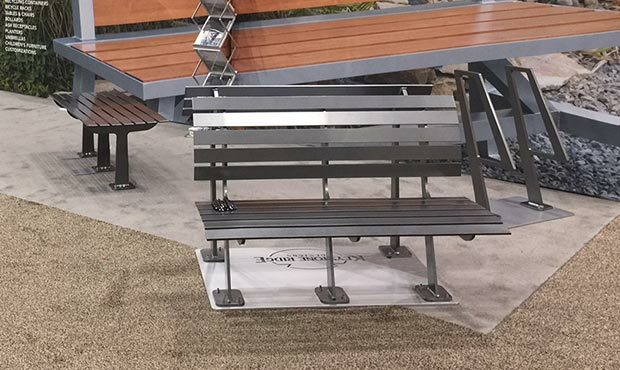 At the ASLA show, the full series was looking sleek in our custom Chromite finish. As public spaces evolve, so do the furnishings. Outdoor settings are becoming more flexible and they inspire social interactions in new and creative ways. With that in mind, we designed the Loma. The Loma Chaise Lounge expands place-making possibilities by offering an inviting alternative to traditional seating. Turn any outdoor space into a relaxing environment with the graceful design and comfortable contours of the Loma. An extension underneath provides visual interest as well as a storage solution for cushions or pillows. 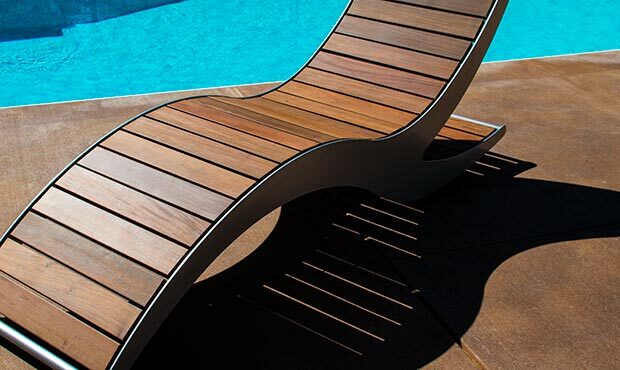 Whether for poolside resorts, patios, parks, colleges or corporate campuses, the Loma Chaise with Ipe slats brings beauty and durable, commercial-grade function to lounging around. It was a crowd favorite at the trade show. We’ve mentioned our KeyshieldArt™ capabilities in the past. It is our proprietary process of fusing imagery into our powder coated furnishings. We showcased a unique application at the ASLA Expo with a custom designed side table to coordinate with the Loma. 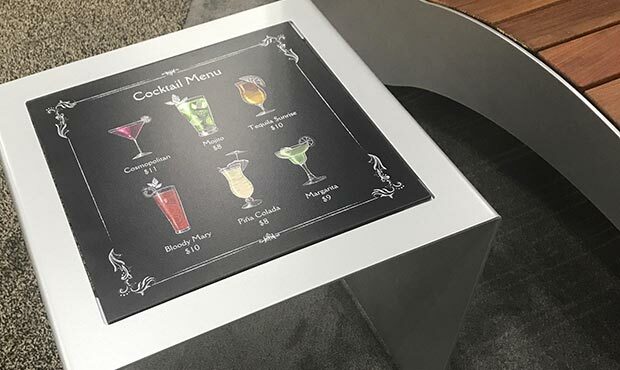 A KeyshieldArt™ top plate was incorporated into the design to serve as a convenient cocktail menu display. Picture the possibilities for logos, advertisements and other functional signage such as menus or other informative content. The insert can be made permanent or altered to be removable for future changes. Either way, you can guarantee durability to daily uses, full customization of any image or graphic and easy cleaning. Coming off the success of our new product launches, our graphic design department is already busy planning for the 2018 catalog. It will of course include the new designs as well as some other surprises. Make sure you are registered in our system to get your copy when it’s ready. As 2017 winds down and we prepare for next year, you can trust that our designers and engineers are constantly researching trends, experimenting with new possibilities and working hard to continue the quality and originality that is the foundation of Keystone Ridge Designs’ reputation.